Almost all of our custom homes are one-of-a-kind designs. R.L. Diorio's design/build process takes the customer from lot selection to design through pricing and contracts to construction, then move-in and later follow-up work to adjust or correct any defects. With over 26 years in the custom home business, R.L. 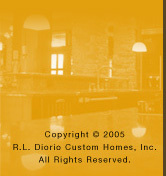 Diorio is certainly qualified to help you with all of your new home needs and wishes.